We all love the colorful richness of science fiction pulp cover art. But pulp art didn't spring into the world fully formed, full of beautiful women adventurers and marauding robots. Science fiction book cover art as we know it today was born in the pulp era of 1920-1955, but the process of evolution actually started decades earlier. Here's a brief history of science fiction cover art, charting its earliest development, from the 1860s into the pulp era. Before the internet, television, and radio, print media was the primary source of information and entertainment. What we think of today as magazines used to be newspapers called broadsheets. They were large sheets of paper printed on both sides with news and illustrations. Following advancements in printing technology, these broadsheets were bound in the magazine format we know today, but were still fundamentally newspapers and retained the same look. The Victorian aesthetic appeared from 1820-1900 and is characterized by tons of ornamentation, both in imagery and typography. Most book and magazine covers escaped excessive imagery, but faltered under cluttered typography. Captions often accompanied images to narrate the moment of action rather than allowing the image to speak for itself. Images portrayed a single moment in the story meant to captivate passersby with feelings of adventure and excitement. Actions and poses were stiff and often awkward. Color was expensive, and not commonly seen until 1900. Scientific American is one of the longest running science magazines (still in print today) and its early covers maintained a newspaper look until around 1900. If I lined up 20 Scientific American covers from this time period, they would all look basically like this one: bold title banner across the top, the beginning of the cover story beneath the date bar, and the image(s) taking up most of the bottom. Why yes, that is an early-model gatling gun mounted on that camel. In terms of design and composition, this is a great cover for 1872. The title logo is easily identifiable and legible. The sub title bar doesn't compete with the main title, but adds to it, clearly defining what topics the magazine will cover. The date bar clearly marks all the necessaries: volume, issue, publisher, date, and price. The headlining story begins immediately beneath the date bar, and is demarcated in three columns. The overall look is clean and sparse with no frills. This cover says clearly that it's a science magazine and camels mounted with gatling guns are the main topic of this issue. And the image of that camel and that gatling gun totally sells the story. The image was most likely lifted or composited from a photo or a journalist or explorer's field sketch, because the camel is exquisitely rendered and clearly drawn from observation, as is the man. The stark black and white makes the image pop by creating high contrast focal points. The camel and the man have the highest contrast of values making them stand out from the legion of weapon mounted camels in the background. The foreground camel is positioned in such a way that both lines of camels in the background are unobstructed. His gatling gun becomes the focal point, isolated against the plain sky, symbolic of potential violence and action. The man in the foreground stands with stiff contrappasto beside his camel and another man echoes his posture in the background. Their message is clear: Look at our camels and our sweet gatling guns. Our military tech would own you. Underlying the academic nature of the publication is the need to entice the readership with a sense of adventure. People didn't travel for leisure back then, but for those who bought this issue of Scientific American, a foreign land full of soldiers and their weapon-mounted camels was at their fingertips. On the other side, fiction stories by respected authors like Jules Verne's From the Earth to the Moon were bound in hardcover books and marketed to the wealthy. Great care was taken in the exterior and interior design, the look based in traditional etching and print making. As with Scientific American, this cover is simple and focused. The gilding literally highlights the pertinent information in the image, namely the title, the spaceship, and the moon. Metaphorically speaking, the title is the atmospheric barrier between the earth and the moon. The spaceship penetrates the atmosphere to reach space and its final destination. If you don't like metaphors, the ship is pointing straight at the moon and the title is "From the Earth to the Moon." Obviously, this is a book about people who go from the earth to the moon. The author's name only appears on the spine, which was not standard practice but not uncommon either. The interior images are considered by some to be the first modern illustrations of space travel, showing the launch of the space capsule, referred to as the "projectile," out of a very large cannon, the journey to the moon, and the three dapper explorers surveying the moon's surface on arrival. Need I point out their lack of space suits? The images were created using pen and ink, where black ink is built up over the page, or by scratch board, where the page is covered in black ink and carefully scratched away. The simplicity of the cover is continued through the interior images, which use basic vertical and horizontal compositions to isolate focal points and convey moments in the story. These next three images illustrate the same story in three different publications a few decades apart. I'm only going to talk about the dime novel cover, but I want to point out how these three images are copies of each other. The Boys of New York and Frank Reade images are exact copies, modified slightly to suit the needs of the story, which wasn't an uncommon practice when copyright laws were lax to nonexistent. The story is that of The Steam Man, based on a real invention by Zadoc Pratt Dederick in 1868. The Newark Advertiser wrote that, "A Newark machinist has invented a man; one that, moved by steam, will perform some of the most important functions of humanity; that will, standing upright, walk or run as he is bid, in any direction, and at almost any rate of speed, drawing after him a load whose weight would tax the strength of three draught horses." Scientific American and From the Earth to the Moon were exceptionally detailed and realistic, stark in the portrayal of their subject matter. The American Novels cover is loose and sketchy, almost whimsical by comparison. This difference in style could be a conscious choice or a lack of skill from the artist. It's also possible the image was created in haste without much care, because of low pay rate. The steam man was clearly the focal point, because it's rendered in the highest contrast, but if you look closely you'll notice the legs aren't connected to the body in a way that makes mechanical sense, and they seem to exist only on one side of the body. The leg pistons and arms also don't seem connected to the body, appearing flattened and oddly disjointed. What sells this is not the artistic merit but the concept. The steam man was the industrial revolution's response to the clockwork automaton novelties of the rich. As a precursor to the robot, it was an amazing achievement for the time but impractical for the uses proposed for it. The cost to purchase and maintain such a machine was beyond the wealth of the individuals who would most benefit from its services. Nonetheless, it stayed on as a reoccurring figure in the imagination, as part of an alternate future world where everyone had mechanical servants. Art Nouveau came into popularity in the 1880s as a rebellion against the Victorian sensibility that "ornamentation and design were identical functions." Poster art bridged the gap between commercial art and the individual artisan, becoming the most recognizable and popular art form to come out of the end of the 19th century. Regardless of this blend of intentions, "antagonism between art and industry" continued into the twentieth century. But where advertising was just coming to understand the concept of "one idea at a time," book and magazine covers focused more and more on storytelling in a single image. The more focused and effective a cover's visual communication, the less time a potential buyer has to try figuring out what an image meant. Pulp magazines were 7x10 inches, which is not much real estate to convey the grandeur of the universe. The economical use of color, text, and composition found in poster art influenced publishers to put more stock in simpler overall design, one that promoted the magazine as a brand name and a worthwhile read. Whimsy and a hint of adventure were no longer sufficient. Coming into the new century, color, design, and relatablility sold the story. Magazines branched out into a myriad of topics by 1900, and many were providers of short fiction only, always on the search for exciting and fantastical stories to tell. 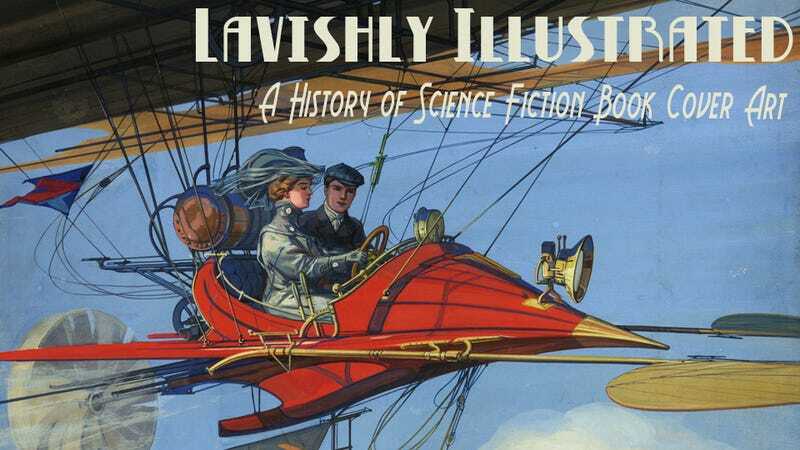 Science fiction wouldn't have a proper home until 1926, and until then was lumped in with all the other adventure stories. Flight was a popular theme in adventure pulps, following the Wright brothers' historic flight of the Kitty Hawk in 1903. It fed naturally into the wholesome adventure story ideology of "proving one's moral fibre" and "the moral rectitude" of conquering natives in foreign lands. Air travel became the darling of the scientific world, and pilots became heroes. The Frank Reade Weekly cover, above, proves that sometimes running the hell away makes a much more engaging cover than one exemplifying "moral fibre." There's a fantastic sense of urgency in those men rushing to climb the ladder before the dog-faced men get them. (Personally, I don't spare much hope for the last two men on the ladder.) The All-Story cover lacks the tension of Frank Reade but captivates with the wonder attached to flight and a very simple, focused composition. It's also significant in this era for depicting a woman at the helm. Women on adventure covers were more typically portrayed like the Argosy and Thuvia, Maid of Mars covers: demure, delicate, and in need of rescue from horrible monsters. This element of sexual fantasy gained substantial marketability entering the twenties but wouldn't find its way into science fiction covers until the thirties. Some publishers were more interested in the science part of science fiction than the adventure part. The Annual Science Fiction Achievement Award, better known as the Hugo, is named for publisher Hugo Gernsback for his early contributions to science fiction. He is credited with coining the term "science fiction" and best remembered for creating the first pulp magazine dedicated to science fiction writing, Amazing Stories in 1926. Often considered the first futurist, Gernsback was in love with technology and all the possibilities of the future. He launched his first publication in 1908 called Modern Electrics, in which he serialized his own science fiction story Ralph 124C41+ (a play on words, one to foresee for one). As a story it was a failure, but Gernsback's predictions for future technologies like video phones, television, and practical solar energy were eerily on point. Frank R Paul became Gernsback's primary illustrator after Modern Electrics became Electrical Experimenter around 1914. Trained as an architect, Paul's artistic strength lay in his cityscapes and renderings of technology. His people were stiff, sometimes crudely drawn, by comparison and his fondness for pure reds and yellows was considered garish even for the time period. But no one envisioned the future the way Paul did, and his vision would influence science fiction writers and artists alike for generations. The cover of the first issue of Modern Electrics was totally behind the graphic design times in 1908. Cluttered images and text made it difficult to tell at a glance what point it was trying to make. As a science only publication, Gernsback used images of experimental technology like the "Hypno-Bioscope" and the "Space Flyer" to entice people to read on later issues, but with most magazines boasting painted color illustrations, pen and ink work wasn't reaching the audience Gernsback desired. Many early publishers learned through trial and error what design elements worked best for selling product and Gernsback was no exception. His first publication changed names twice and evolved its outward design quickly to keep pace with the ever changing commercial design world. By 1913 Gernsback's publication was graphically up to speed. The Electrical Experimenter and Science and Invention covers show Frank R Paul's early cover work and his stiff approach to the human figure. Gernsbak's vision of the video phone is rendered beautifully on The Electrical Experimenter cover, but the woman on the video screen appears flat and deformed with her large, wide set eyes and forehead consuming hair. Most disturbingly, she appears to be jamming the listening end of the telephone into her ear canal with her disembodied hand. The video phone concept is fascinating, but the image is static and largely void of story. The Science and Invention cover has a better since of story with this poor man floating untethered in space, but even with a strong diagonal composition the image is static. Points to Paul for rendering one of the first space explorers wearing protective gear. Unfortunately, the space man has mitten hands and a planetary tangent in his crotch. The beauty of science fiction and of its art in these early days was near total freedom from scientific absolutes. So many things were unknown to us that literally anything became possible. What Paul introduced in the Amazing Stories pulp covers was a tremendous sense of personal style. His covers weren't always the most dynamic or exciting, and they definitely lacked in damsels in distress, but they became iconic. Most pulps would adopt the same overbearing dramatic style and subject matter but few ever came close to the bold color choices and technical details of Paul. Amazing Stories launched in 1926 and Paul provided all the cover and interior work until 1929. The first issue of Amazing Stories is dominated by a colossal ringed planet, the title, and the soon to be common place, pure yellow sky. Are those figures ice skating yetis or are they people in parkas? It's difficult to tell. The paint application is rough, almost a dry brush, adding texture and also a sense of movement to the figures and play of light over the ice. The background Unlike Gernsback's previous science magazine, the typography is balanced around the image. Nothing feels cluttered or vacant. The War of the Worlds cover is exceptionally flat because of the pure blue, red and black dominating the background. The tripods are well detailed and the people are fudged down there in the corner, looking like they're standing in a giant hole compared to the horses next to them. Odd as the perspective is around the people, it's an impressive image and captures the terror of our first alien invasion. The Buck Rogers cover shows off Paul's architectural training. The house, the trees, the lawn, beautifully rendered. The people, eh not so much. But that yellow sky with Buck Rogers zipping across it in his red suit is instantly recognizable. It marks the importance of color and silhouette in defining subject matter and attracting attention. Amazing Stories and a similar science fiction pulp combined after 1929, becoming Science Wonder Stories. Paul illustrated Hermann Noordung's vision of the first space station for one of the first covers of the new pulp. Space stations and ships are commonplace on covers today but in an era when most people didn't have telephones, they were a unique, optimistic and imaginative dream of the future. Part two of this article, covering 1925-1955, will appear next week.